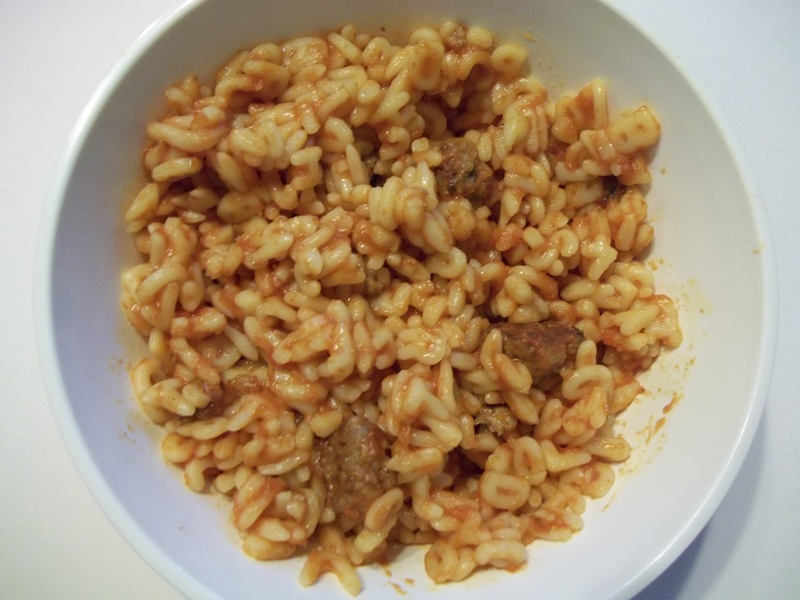 My own DIY version of ABC Spaghetti-O's with meatballs. 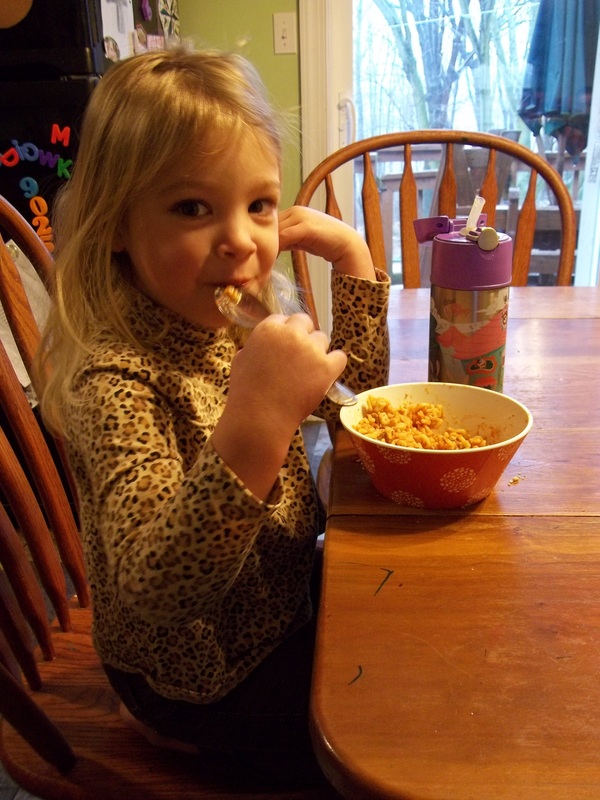 My twins are once again on a big Spaghetti-O’s (with meatballs!) tear, requesting them almost every day for lunch. 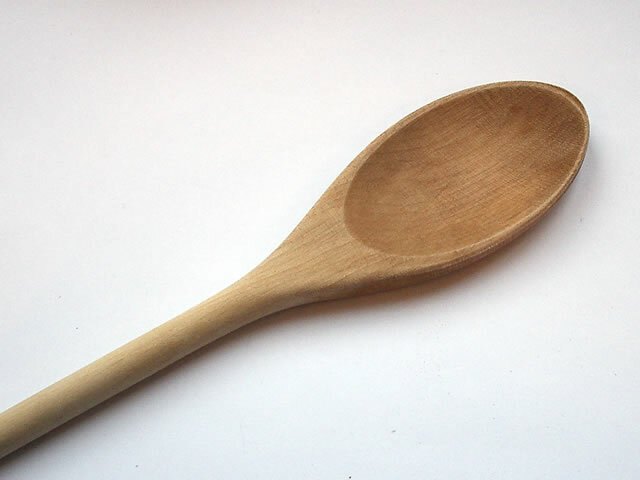 They easily go through more than a can of these at a sitting. I usually purchase Spaghetti-O’s at our local bent and dent grocery store for 55 cents a can, which is a pretty good deal considering they sell for close to $1 for a small can anywhere else. Well, I ran out this week and vowed to not buy any for a little while. 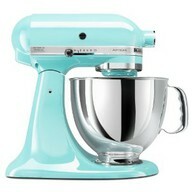 Why in the world couldn’t I just make my own? 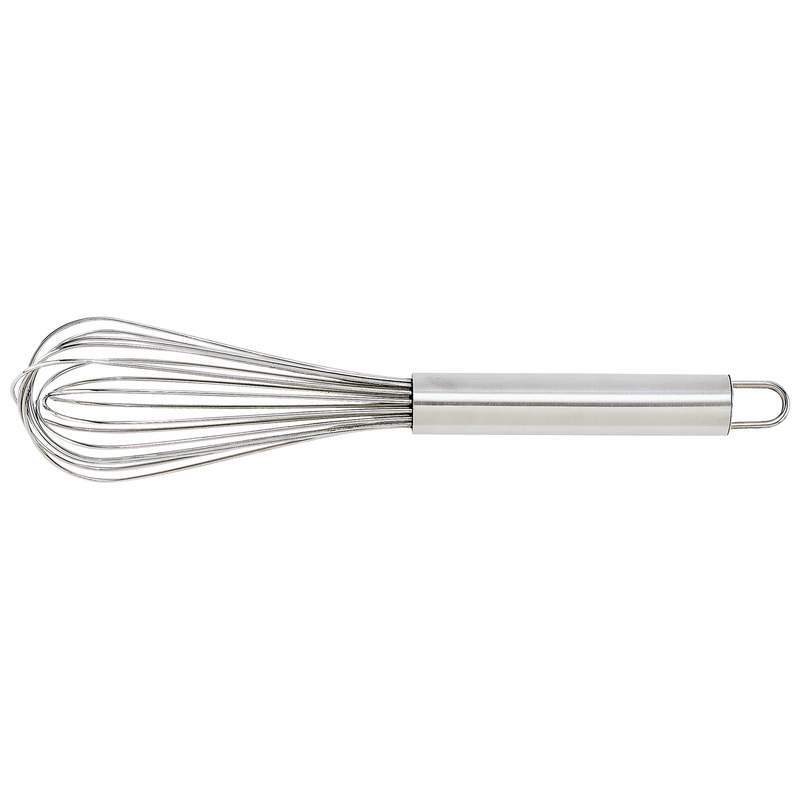 They’ve got to be simple, plus we all know homemade is typically healthier by a long shot. I didn’t have any “O” shaped noodles, which are called anellini, but used alphabet noodles instead. A 2 pound bag to be more specific. As you can tell, it made a LOT. Honestly, I didn’t use a set recipe, just kind of threw this together as I went. 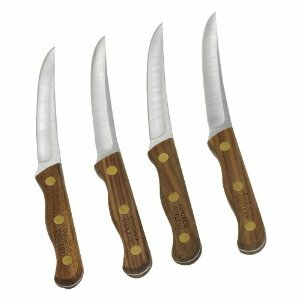 Here’s what I used, and once again I apologize for not having set amounts, etc. I’m not always the most detail-oriented person, but I don’t think you can really mess this up. -Meatballs-ground beef, bread crumbs, milk, parmesan cheese, seasonings (salt, pepper, Italian seasoning, etc. ), worcestershire sauce. Roll into 1″ balls, place on baking sheets, and bake at 400 for @15 minutes or until middle is no longer pink. 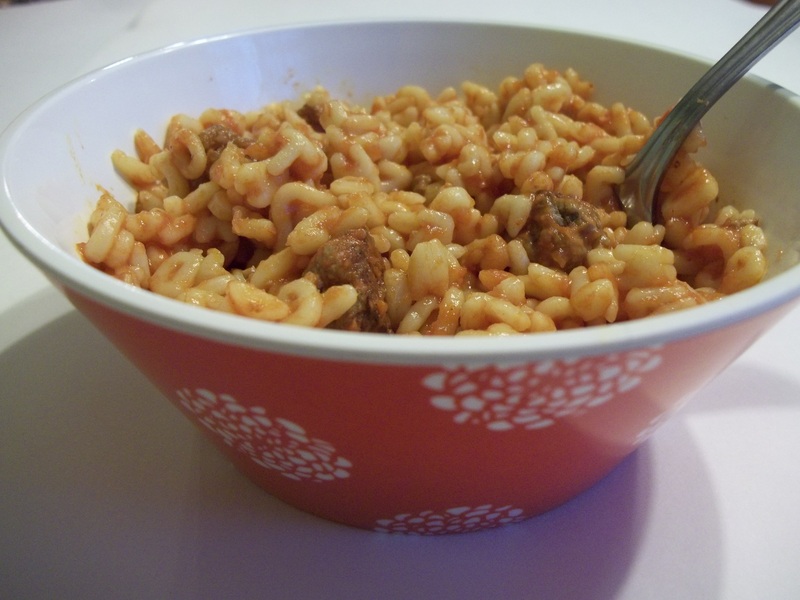 Combine cooked noodles, tomato sauce, and baked meatballs in a large saucepan and heat thoroughly. Season to taste. One of my cutie-pie nieces taste testing them. She didn't say they were "yucky" and ate a huge bowlful, so I guess she liked them! Now, the only question is, what do I do with this many Spaghetti-O’s? Do I can them? 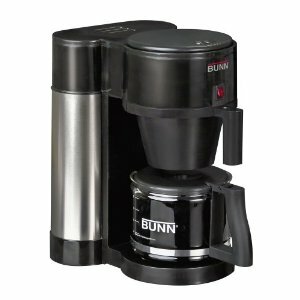 Freeze small batches? I do have to mention that these did not cost much to make and I ended up with I have no idea how many cans’ worth on my hands. 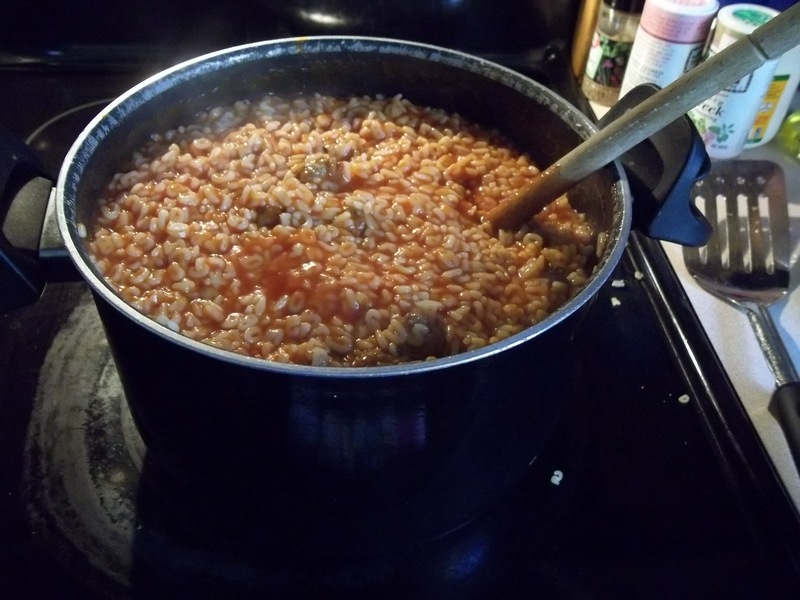 So, it may be cheaper and healthier to make your own if you have a bunch of Spaghetti-O fiends in your household. I actually made this wreath quite awhile back, but just hung it on my front door within the past week. With less than a month of official winter to go, and with an almost balmy feel to the air today, I may have spring fever! 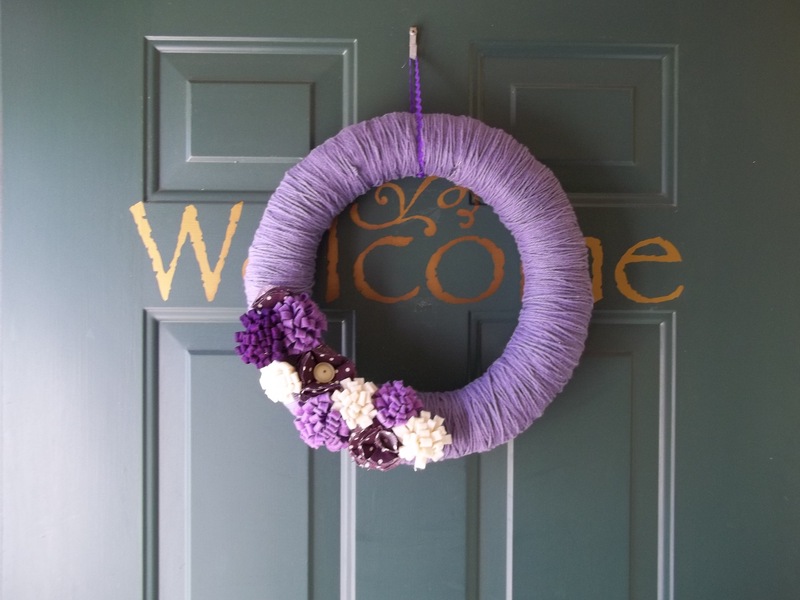 -Choose a foam or straw wreath form and a basic yarn in the color you want. 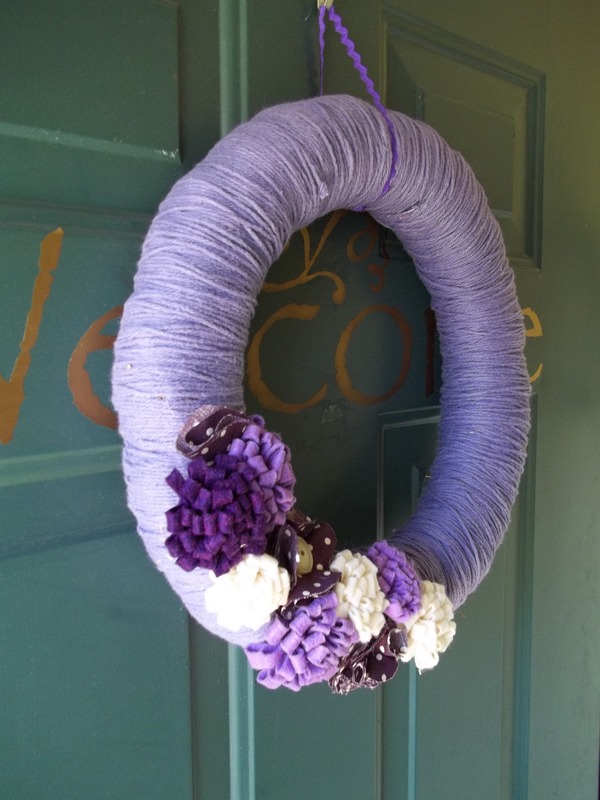 -With a generous dot of hot glue to hold one end of yarn in place, wrap yarn continuously around the wreath form. Just a word of warning–this does take some time and patience! Try to cover the entire surface of the wreath as best you can. 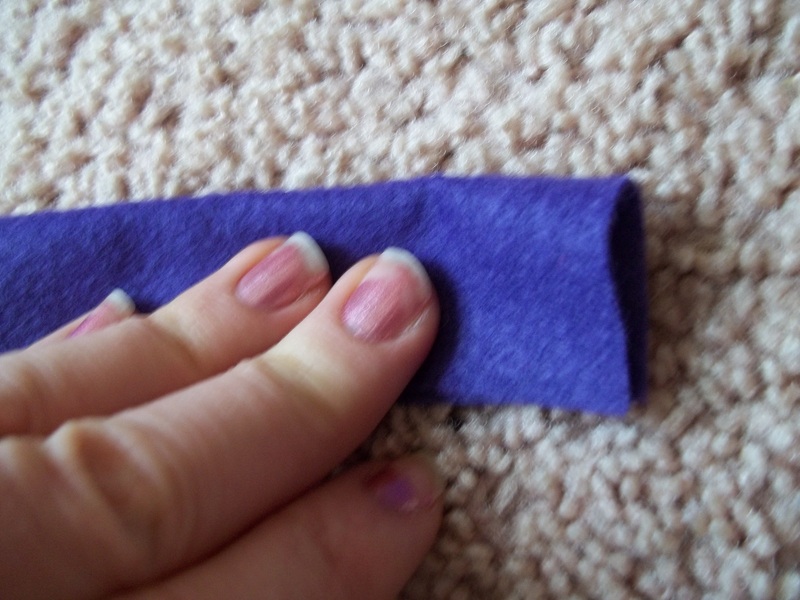 Cut a long strip of felt and fold in half lengthwise. Run a line of hot glue down the "open" end to seal. Using sharp scissors, cut through both layers, leaving a little bit together at the end where you just glued. 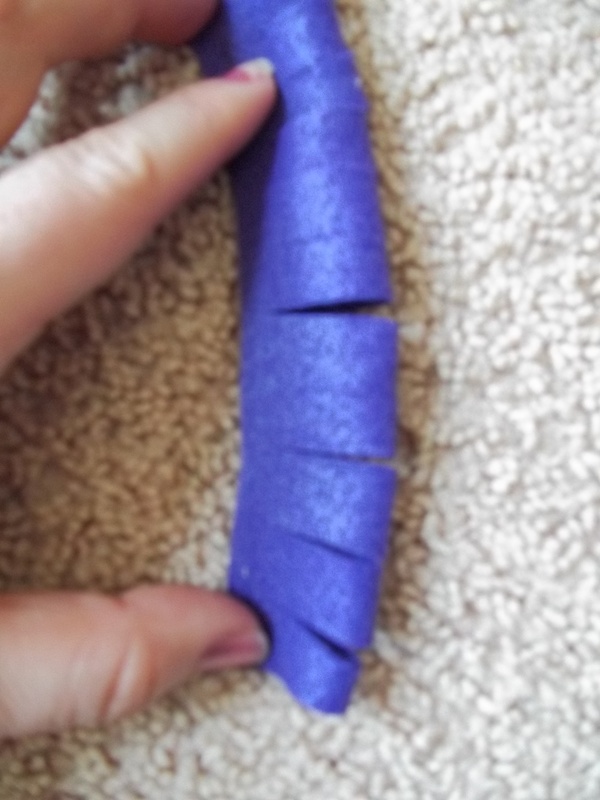 You will cut slits down the entire length of the felt. Roll up the entire way, gluing as you roll. Try to keep the bottom as flat as possible. 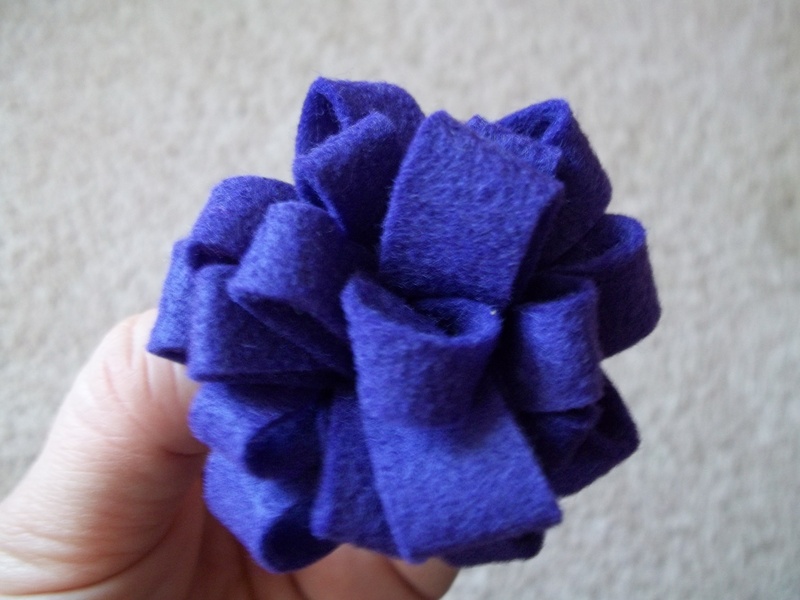 You should now have a pretty felt flower to use. That’s pretty much it. 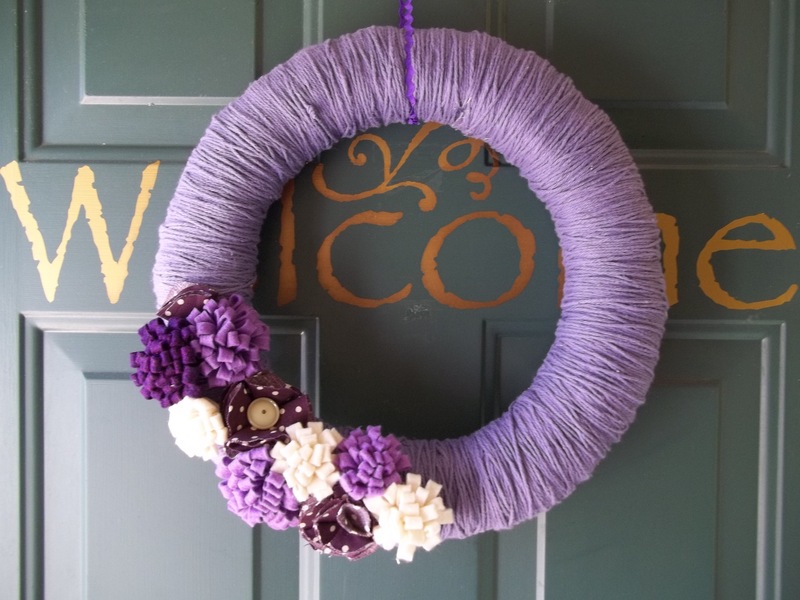 There’s tons of possibilities for prettying up these yarn-wrapped wreaths. Pinterest is a great source for ideas and inspiration for these (and many other things). Yep, I have a little bit of a problem when it comes to Pinterest, and I know I’m not the only one!! 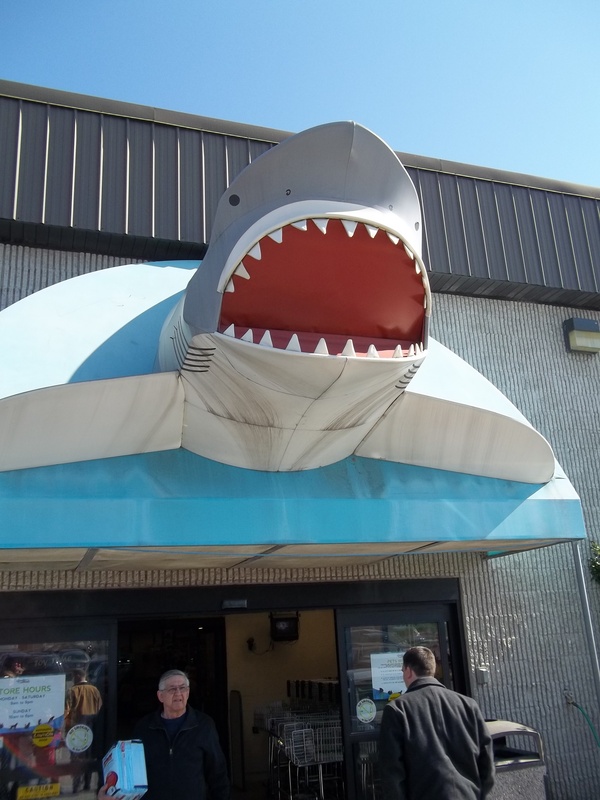 We made our rounds of the store, checking out all of the creepy-crawlies, along with lots of fish. 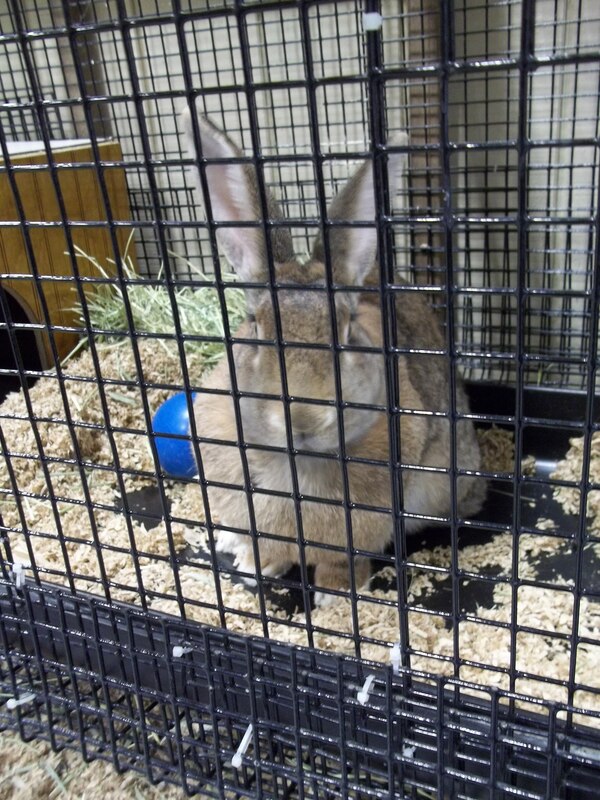 A 16+ pound Flemish Rabbit. 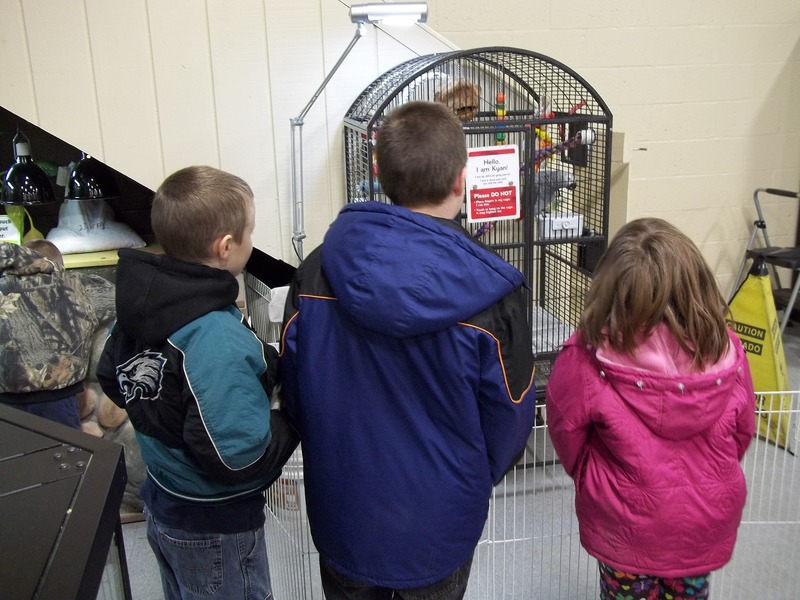 3 of my peeps checking out the talking parrot. 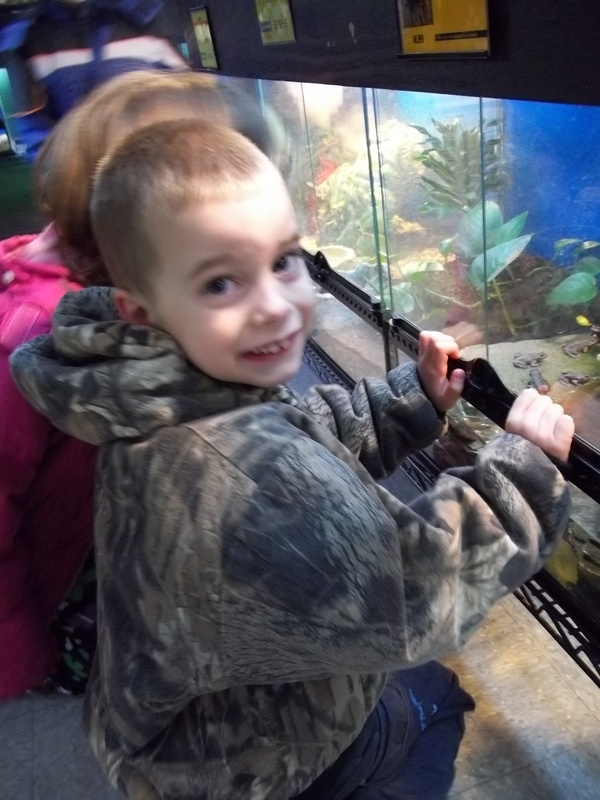 Joey cheesing it in front of the turtle tank. As long as this stays behind the glass, I'm okay. 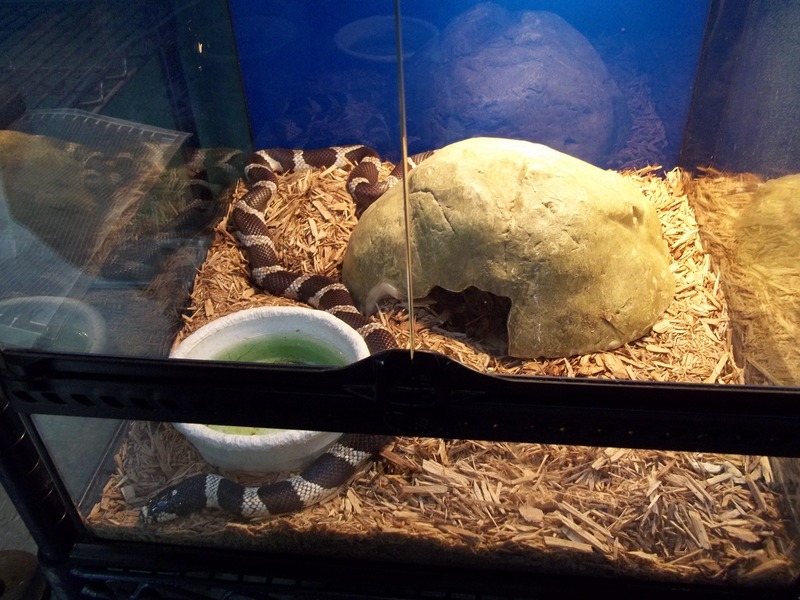 Snakes terrify me. 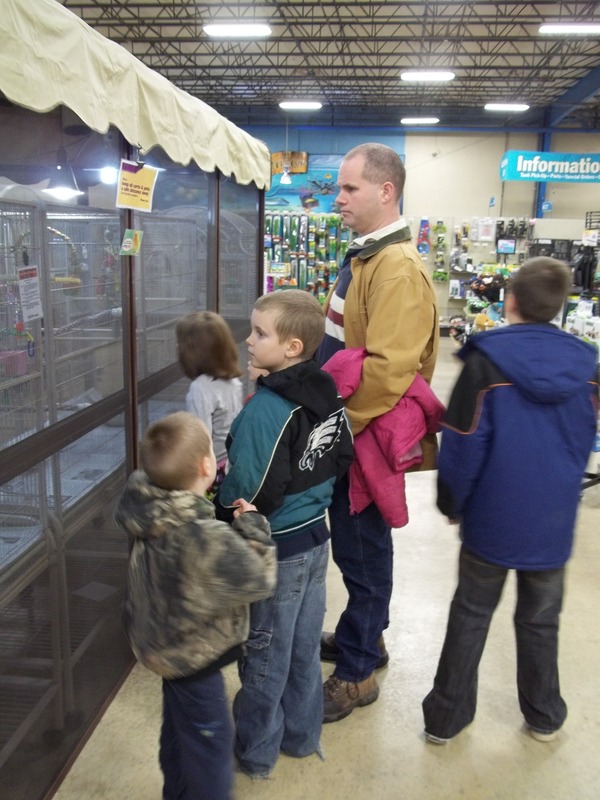 My honey checking out the bird area with the kids. I'm not sure why he's not smiling--maybe because he had enough at that point. Or because he's holding a pink coat. 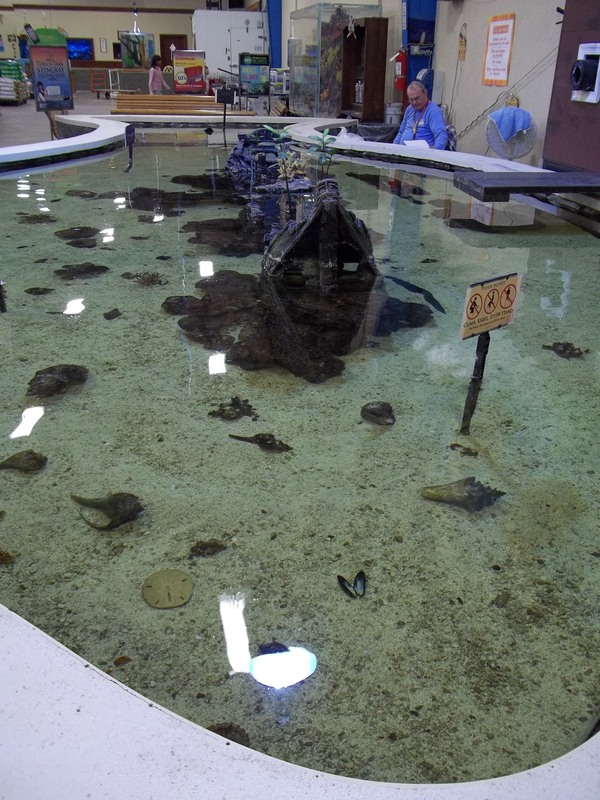 A large touch tank with some rays and a couple of other creatures. Supervising the area was a super cute old man who chatted with us. 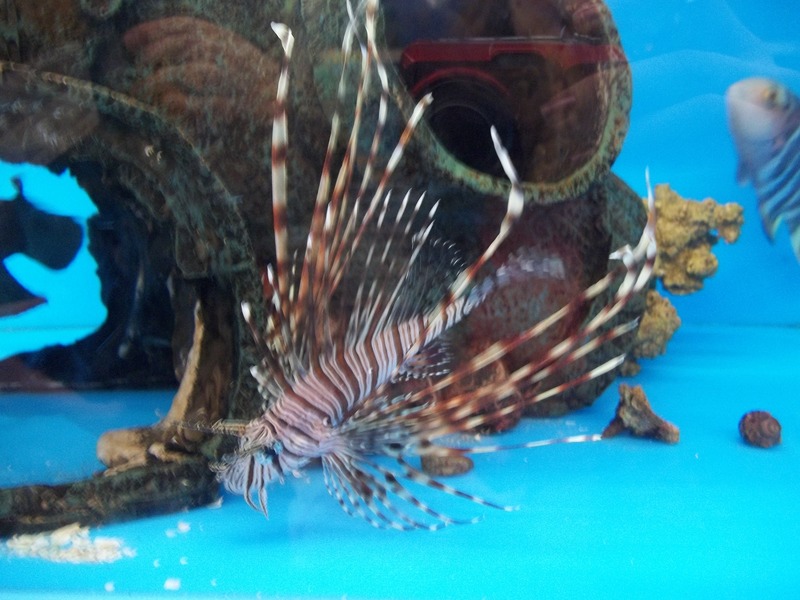 One of many saltwater fish available there. Well, that’s pretty much an overview of our outing. After that, we went to an Indian restaurant called the Taj Mahal (wow, another original name!) that we hadn’t been to for years. Now that part wasn’t free, but we paid just a little more than we probably would have taking everyone to McDonald’s and had an awesome meal. As a bonus, the kids got a different type of dining experience. Sorry I don’t have pictures of this part–maybe I was too focused on filling up with the fabulous eats!! 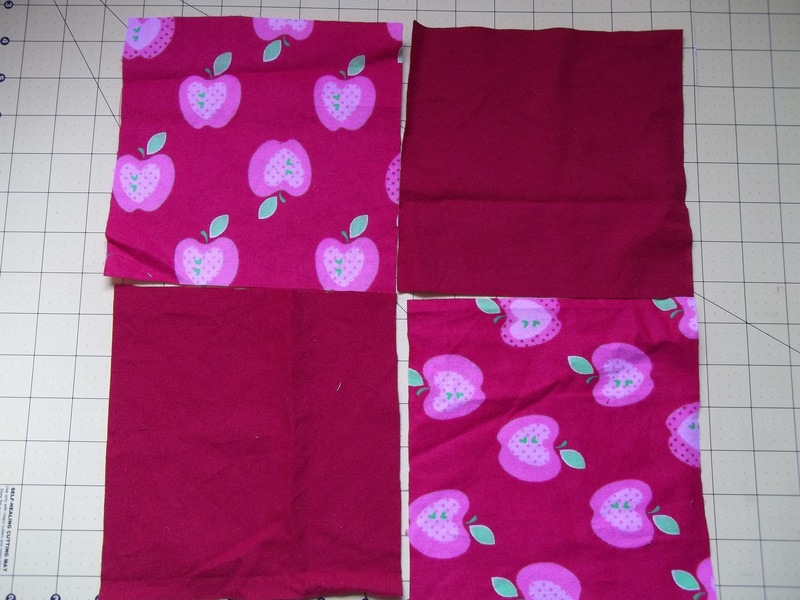 When I was making my cloth napkins in the previous post, I realized that I had a decent amount of one of my favorite fabrics still ready to be used for some kind of project. I’m not much for following a set pattern, so I ran through several ideas in my head. Why not a skirt? 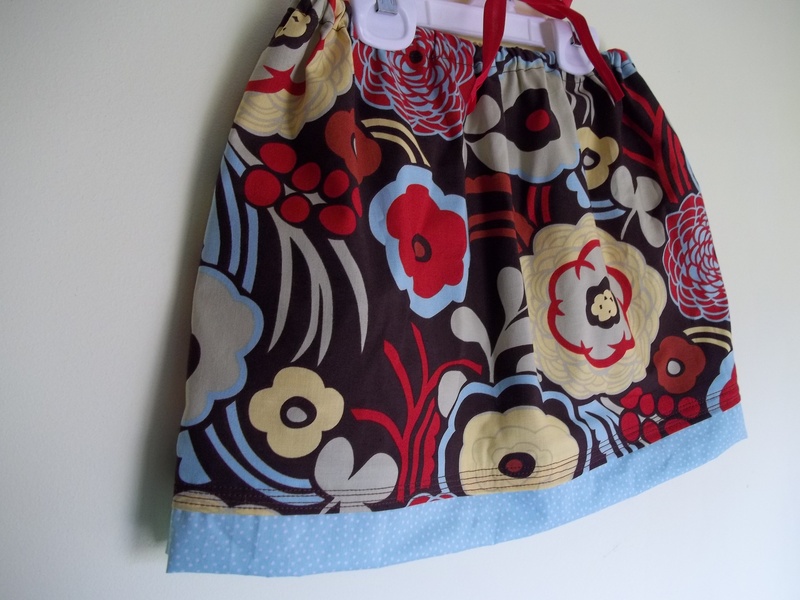 I’ve made a couple already for my daughter, so I didn’t think I could mess it up too bad and waste my pretty fabric. 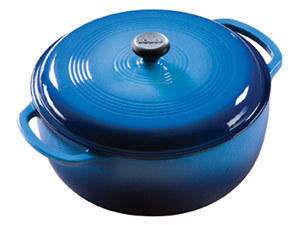 Oh, and wouldn’t it be fun to make one of the accent colors sort of peek out from the bottom? I apologize in advance if my directions aren’t that specific or I didn’t list actual measurements. As I mentioned before, I’m not big on following patterns. So, first things first. 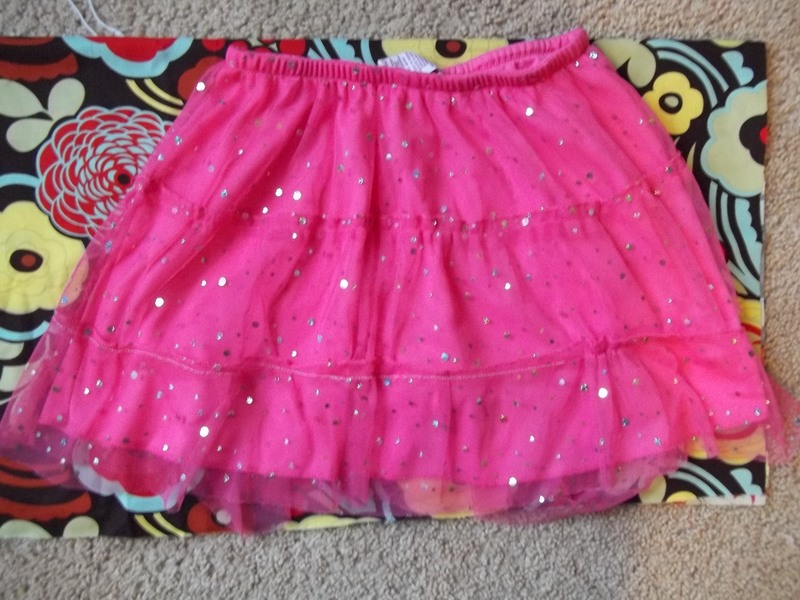 Pick out a fabric, fold in half, and lay out a skirt in the size you want on top of it. Line up one side with where the far edge of the skirt hits it. 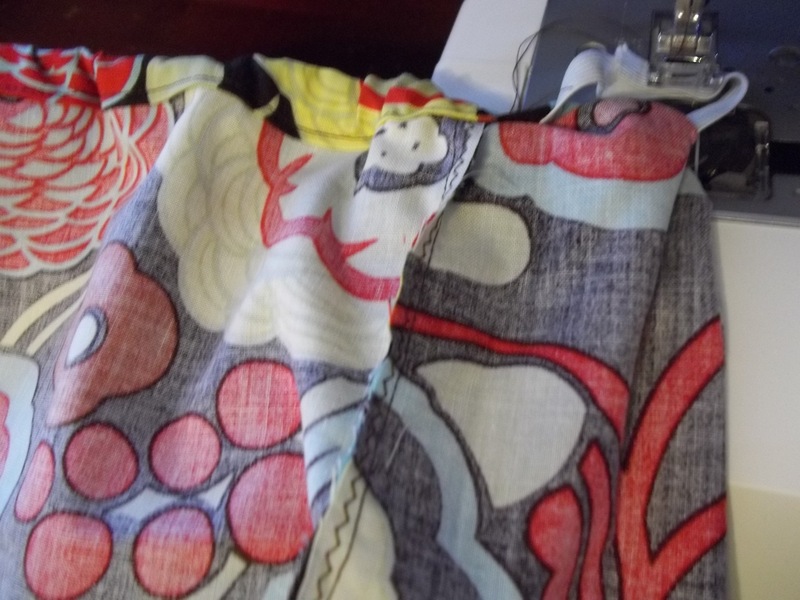 Cut along the opposite side with where the other outer side of the skirt hits it, cutting in a vertical line. 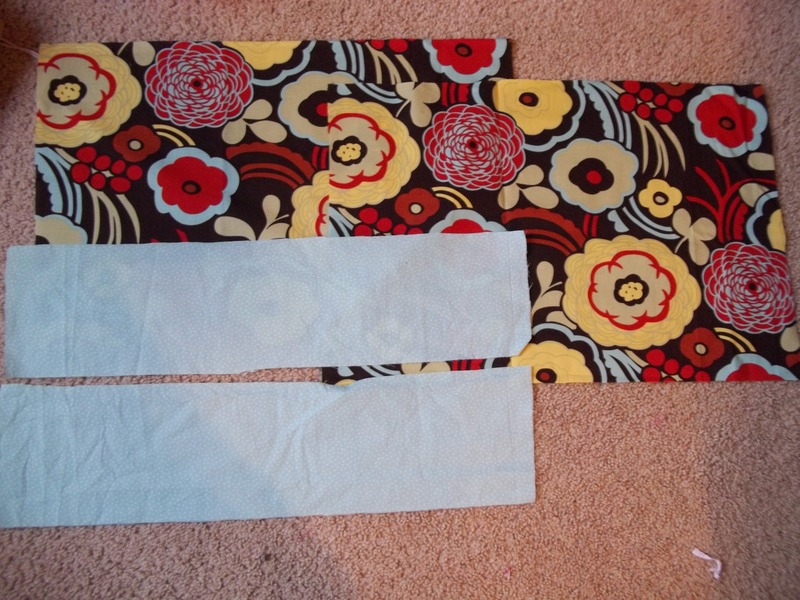 You should now have 2 rectangles of this fabric, which will make up the main body of the skirt. For the bottom accent portion, I cut out two long rectangles which were the width of the main rectangles. They are a little more than double the height of how much I want to show at the bottom of the skirt. 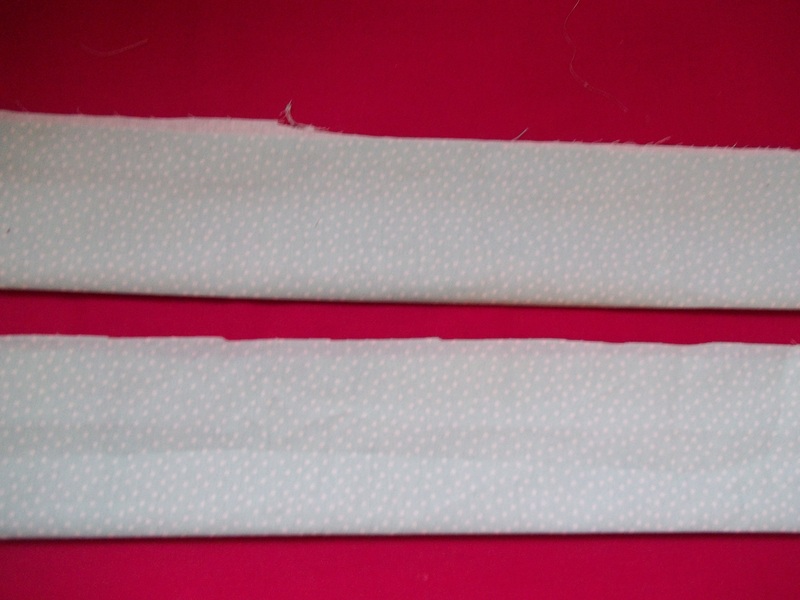 Fold these two long pieces lengthwise and press. Fold down the raw edges 1/4″, then another 1/4″. Sew along this seam to hide the raw edges. Now, taking each main body piece, press in 1/4″, than another 1/4″ along what will be the bottom edge. 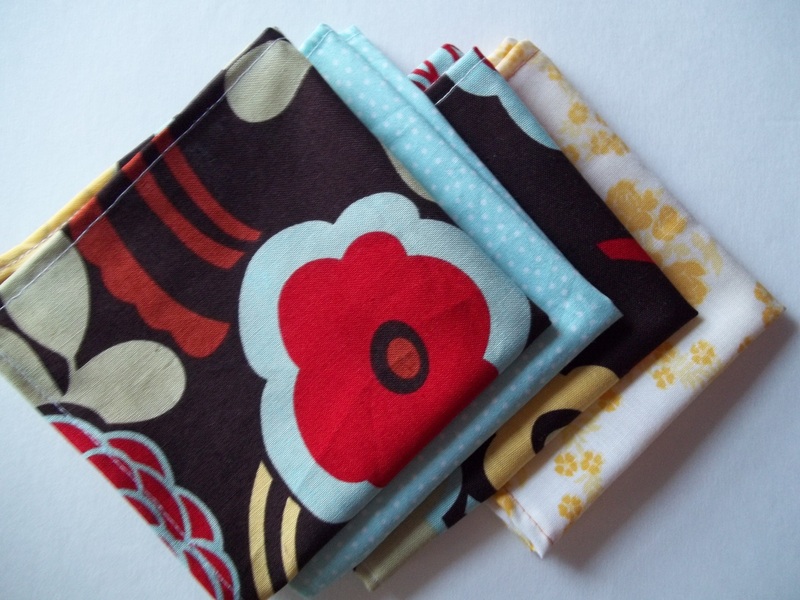 Sew along this edge, using a coordinating thread color. Line up and pin each accent piece to the bottom edge you just hemmed. 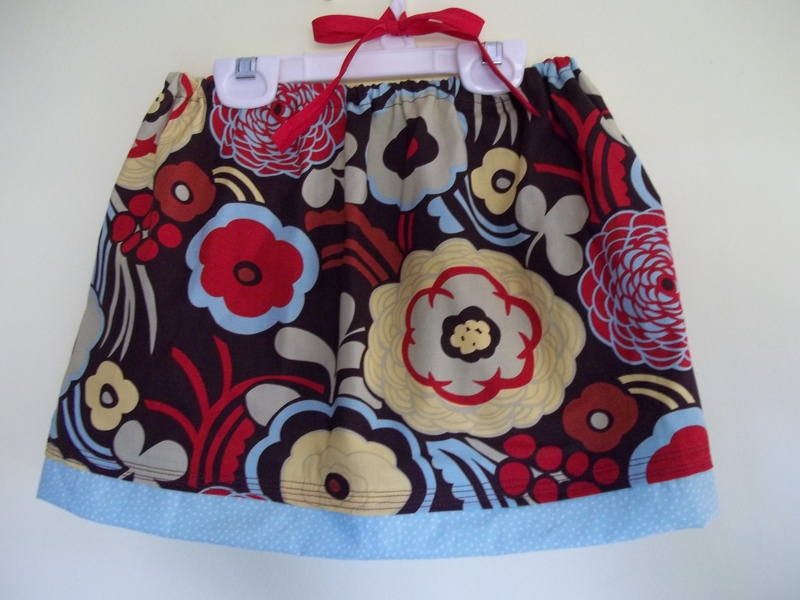 Make sure it is straight and even, matching up both sides of the skirt. 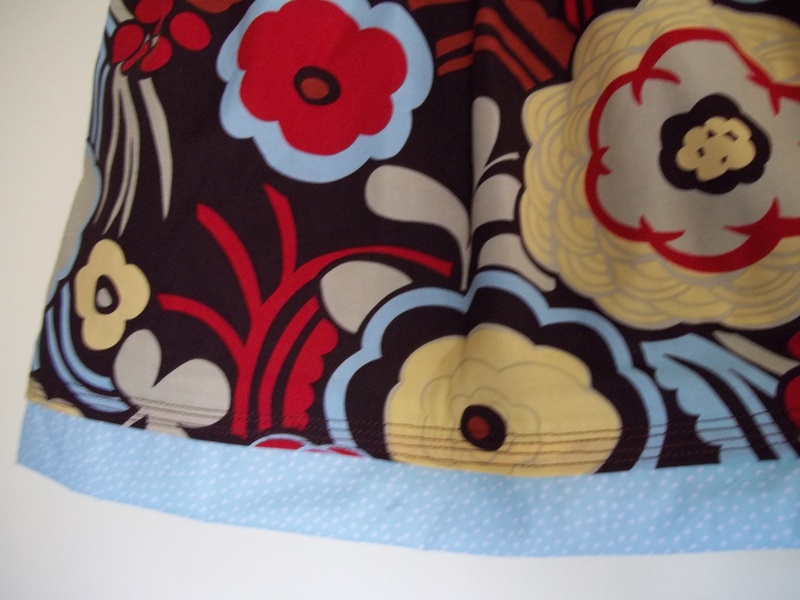 This is important so that when you sew the two halves of the skirt together, everything is evenly matched. 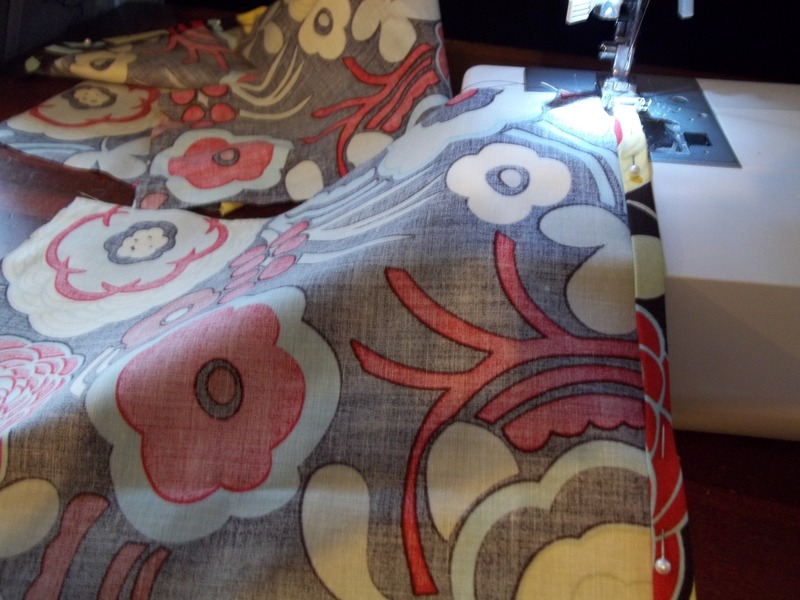 Sew along this line to join the accent piece to the main piece for both sides. I sewed about 4 lines for extra embellishment at the bottom. Now it’s time to join the two main pieces together. 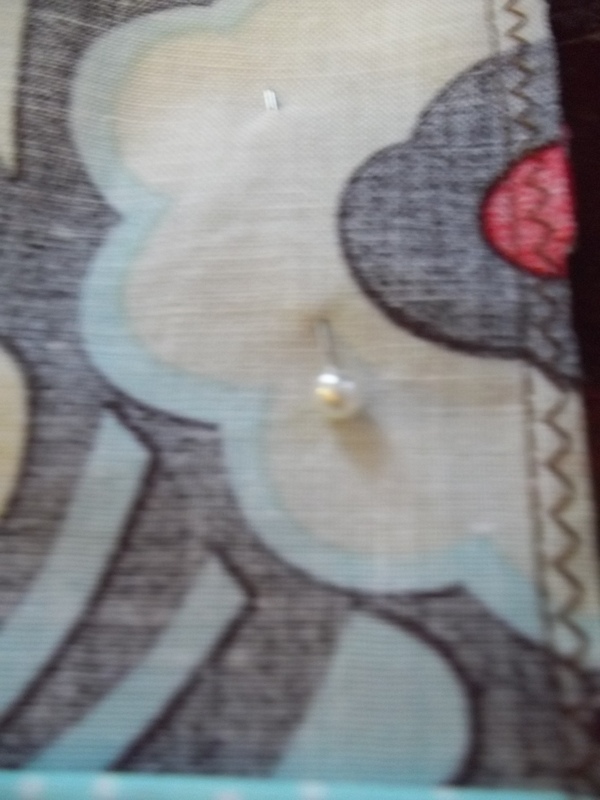 Place them with right sides facing and sew along each edge. I don’t own a serger, so I also did a small zigzag stitch as well. Almost done! Next we want to make a casing for an elastic waist. 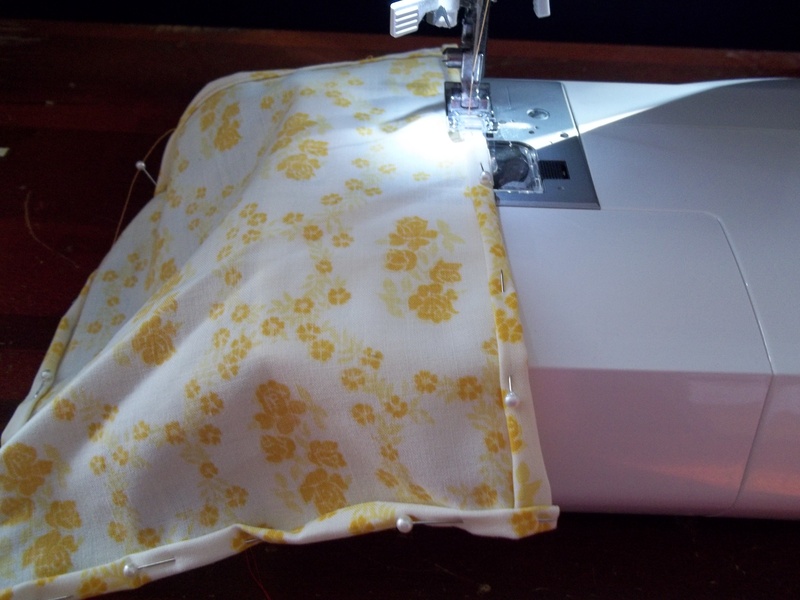 With skirt still inside out, fold the top edge in 1/4″, then in about another 1″. Sew along this line the whole way around, leaving 1-2″ open. Using a bodkin or big safety pin, thread elastic entirely through the casing you just made. 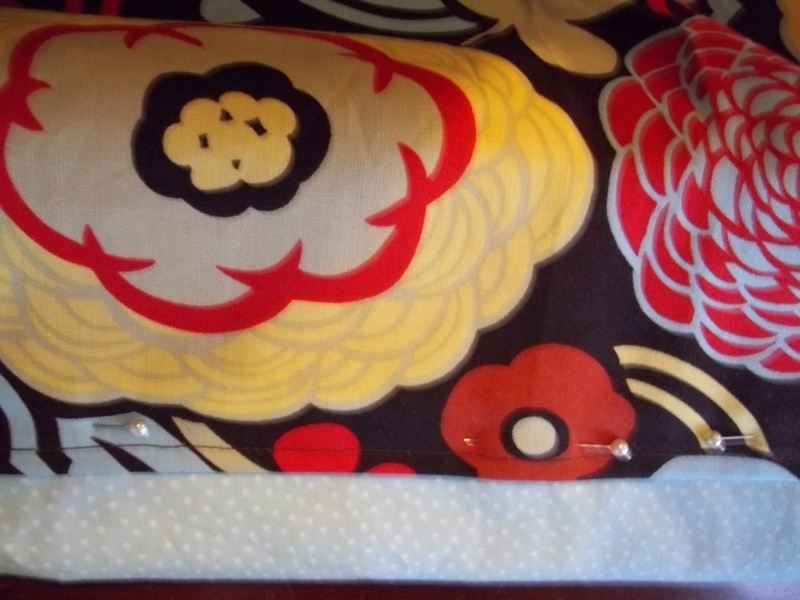 Overlap the two ends of elastic and sew together, backstitching several times to ensure that it will hold well. 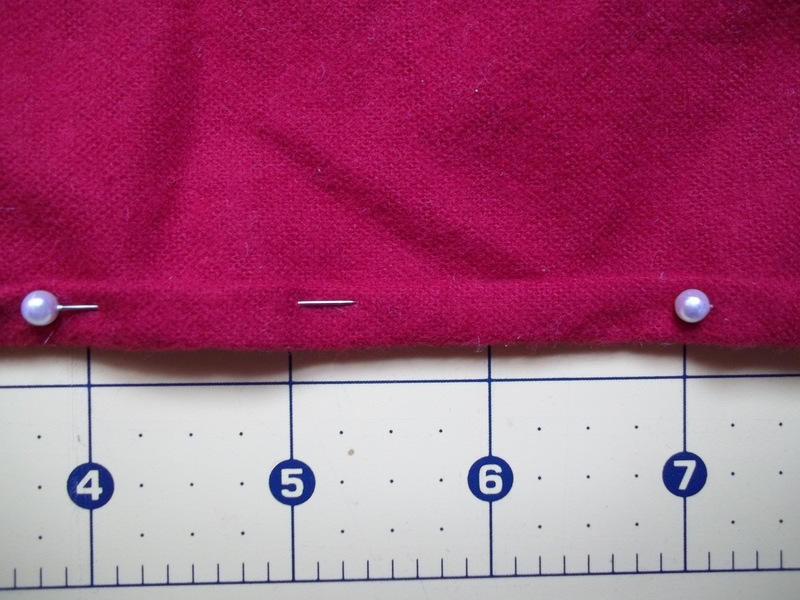 Sew the 1-2″ portion of waistband that you had left open previously. Turn right-side out and you are done! Does anybody else out there feel just a wee bit wasteful? I know I do. Granted, I feel a little bit better when I look at the behaviors of many other Americans. What a big bunch of consumers and waste-makers we are! To make some kind of strides in this area, I am looking for ways to use less paper products in our household. I actually really don’t buy paper napkins, but I know we go through what seems like lots of paper towels, using them for everything from wiping up spills to wiping little faces. Though I’m not quite ready to completely stop buying paper towels, one step in the right direction is to use cloth napkins for wiping faces and to place in lunchboxes. 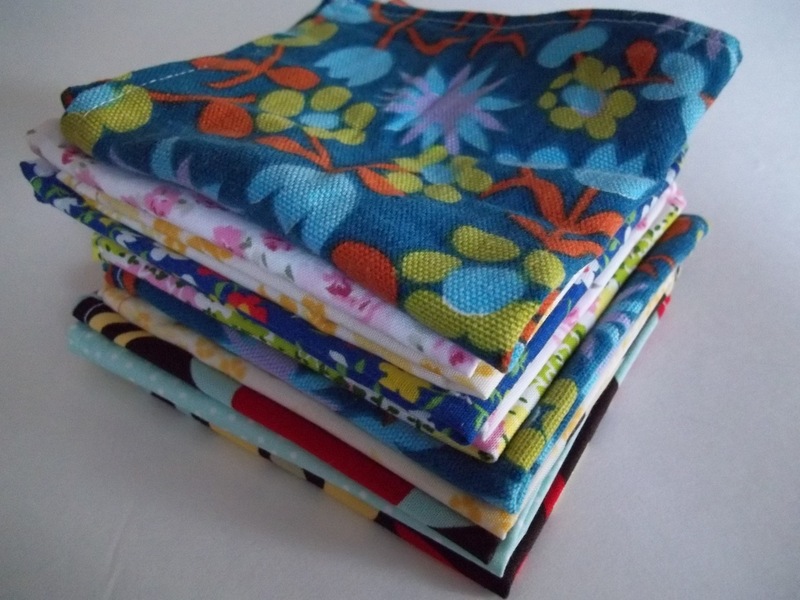 Goodness knows I have plenty of fabric lying around, ready to be used for something useful. Plus, doesn’t using a cloth napkin just make a meal seem more special? We’re not really what I would call a classy bunch, but we can pretend. 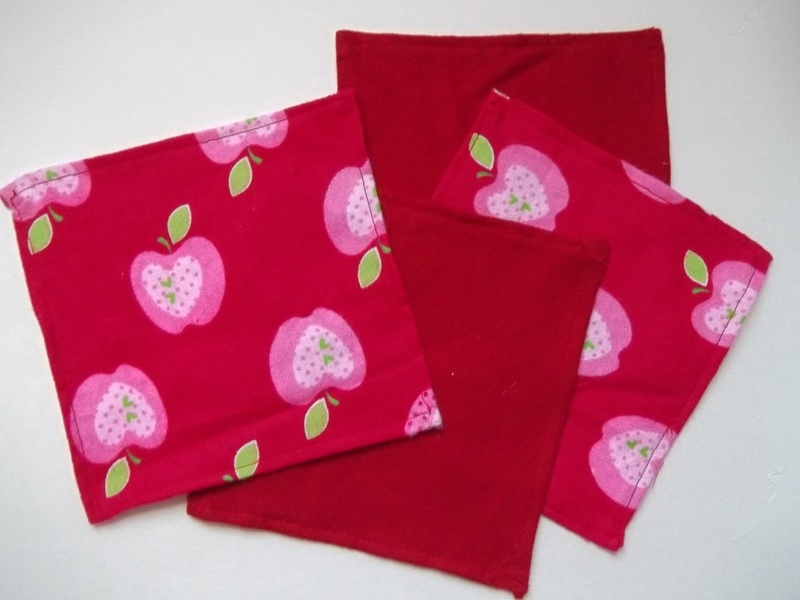 I wanted to do some larger napkins for use at home and some littler ones to put in the school kids’ lunchboxes. I’ll show you how I made the littler ones first. The process is the same for any size. 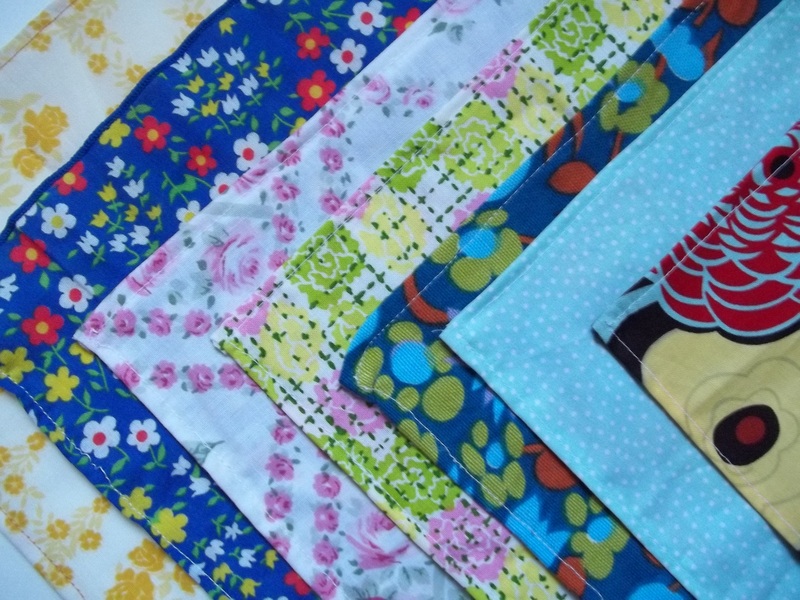 Cut out squares of fabric in whatever fabric you plan to use. 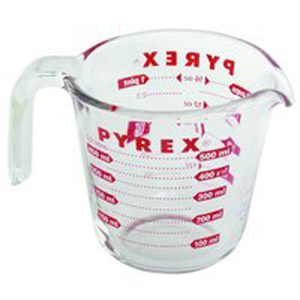 There’s no set size, just figure out how big you want them to end up and add 1″ to the width and 1″ to the height. 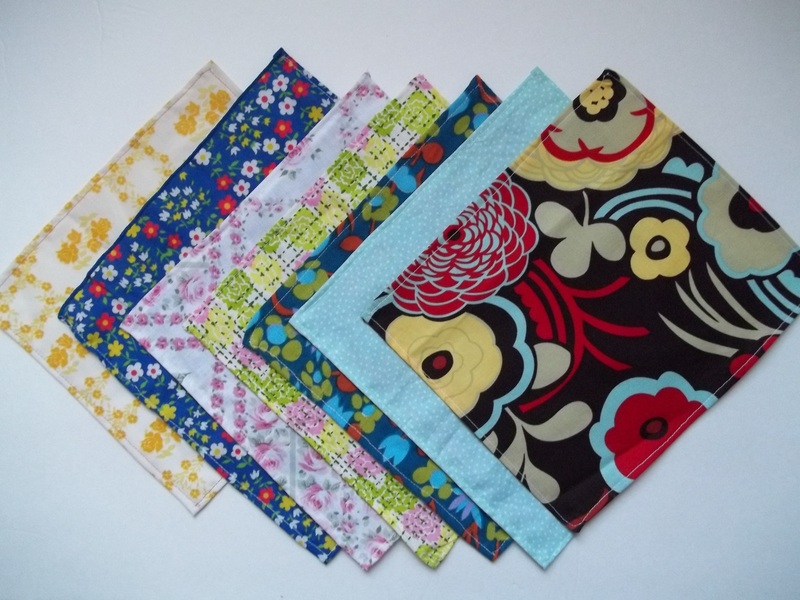 For example, if I want 10″x10″ napkins, I would cut them out in 11″x11″ squares. For each edge, press or fold in 1/4″, then another 1/4″. Pin as you go. 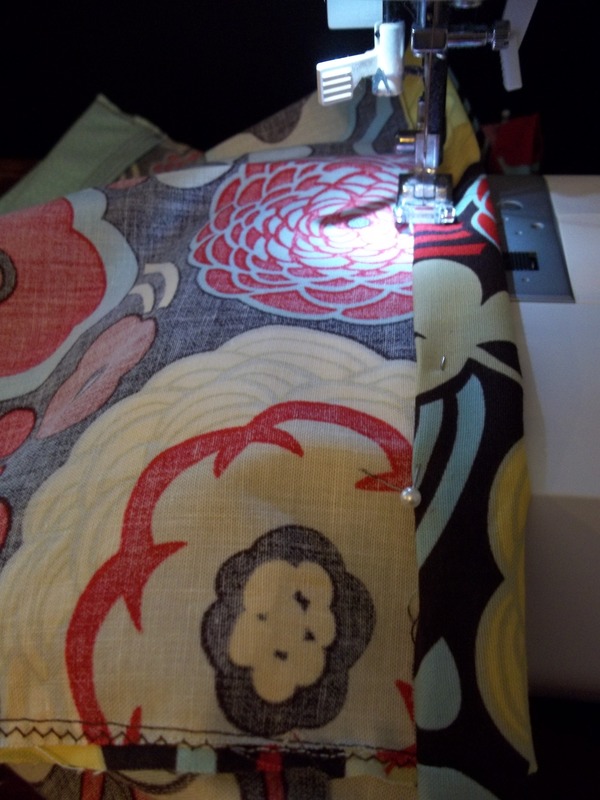 Sew along each edge, using a straight stitch. I didn’t do fancy mitered corners, just basic square ones. That’s basically it. 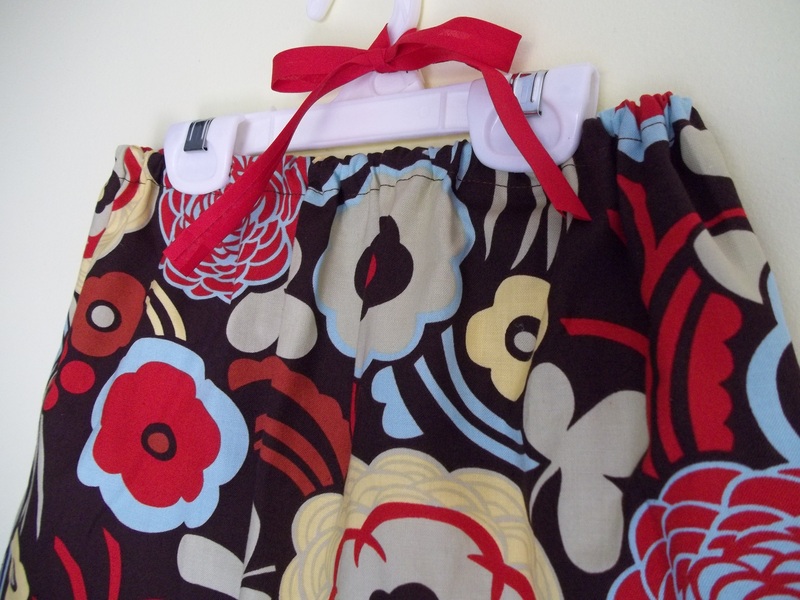 A simple and easy sewing project, great for beginners. I did up a bunch of them in different fabrics. 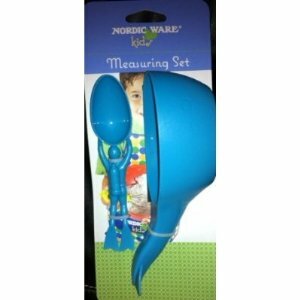 Make up a coordinating set for your own use or as a thoughtful gift. Despite my efforts to come up with “cute” Valentine card ideas, my 10 1/2 year old son Daniel wanted to do something entirely on his own. That was completely fine by me as his siblings used up my other Valentine ideas for their class cards. Yesterday afternoon Dan asked if I had any stamps he could use, grabbed a red ink pad, some cardstock, and hid himself away at my sewing desk for awhile. After an hour or two he came out with a stack of homemade Valentine’s for his 4th grade class and teacher. “Can I look at them?” I asked. Well, my friends, I was utterly blown away by what we wrote in his cards. Each one was completely different and he had a unique message for each classmate. Now, before I go on, let me give you a background on my Daniel. (You can actually check out a post I did on his 10th birthday here for the crazy, miraculous story of his birth.) I know I’m more than a little biased because he’s my child, but he really is not your typical 10 year old boy. Dan reads on a post-high school level. He’s been tested 3 times this school year and has been consistently that high, so I know it’s not a fluke. He is one of the kindest hearted kids you could hope to meet. I’m hoping this doesn’t change as the teen years approach! Daniel is fascinated with all things Bible, loves the Lord like crazy, and isn’t afraid to share his faith, even in our public school. He happened upon my old copy of Jesus Freaks, which shares stories of Christians who have been martyred around the world from the time of Christ. Since he read it, he has been researching the persecution of Christians worldwide and actually subscribes to The Voice of the Martyrs newsletter. I’m not sure how many 10 year old subscribers they have, but I’m guessing not many. Dan makes up little evangelical “pamphlets” or slips of paper with verses and hangs them up or hands them out at school. Okay, that should give you enough of an idea of what kind of kid we’re talking about. -Love your neighbor like yourself. -Love=Kindness. Be a lighthouse of love. -Be strong in the Lord. And remember God loves you. -Jesus loves you no matter what you did. -God is your lighthouse so make him number one. -God has plans for you! -God can do anything. But he chose to save you. -God’s not finished with you yet. 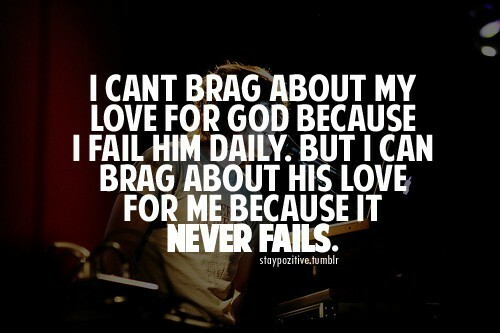 Hopefully, on the eve of Valentine’s Day, this gives you encouragement and reminds you of God’s unending love. It certainly did for me.